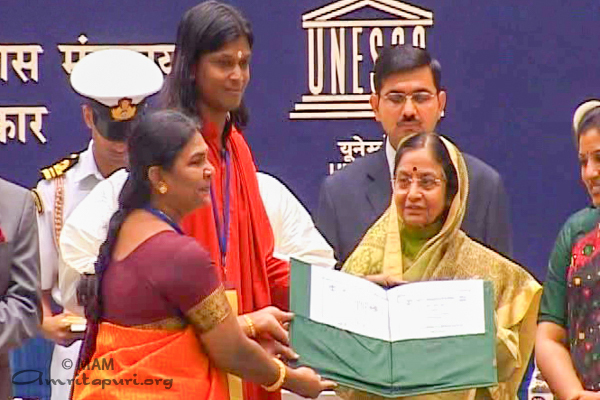 The Mata Amritanandamayi Math [MAM] was presented with a 2008 NLM-UNESCO Award for Adult Literacy. The award was given in recognition of MAM’s outstanding contribution to the Adult Education Program Jan Shikshan Sansthan [JSS] in Sivakasi, Tamil Nadu. 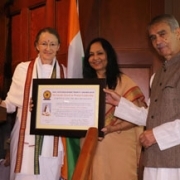 The award was presented at a function in New Delhi by Her Excellency the President of India, Pratibha Devasingh Patil, to Swami Jnanamritananda Puri, the chairman of JSS Sivakasi. When poor children are forced to discontinue their educations in order to work, they never learn to read or write. One of the triumphs of JSS Sivakasi has been its ability to couple literacy education with vocational-training. JSS Sivakasi offers training in everything from tailoring and candlestick-making to driving and mechanics. In 2008 alone, MAM trained more than 2,500 people through JSS Sivakasi and helped them to start profitable careers with their newly acquired skills. JSS was started by the Government of India in 1967. Currently there are 221 JSS programs throughout India. MAM not only runs JSS Sivakasi, but also the JSS in Idukki, Kerala. The Sivakasi JSS was begun in 2003. NLM [National Literacy Movement] and UNESCO [United Nations Educational, Scientific and Cultural Organisationl] have been presenting the award annually for several years in order to encourage institutions working in the field of literacy and adult education to keep up their good work.